Are you looking for data segmentation toolkit to help you organize data in logical groups? If yes then DEXpro data segmentation toolkit is the most fitting solution. The DexPro software follows a process through which different database objects are partitioned into subsets keeping in mind its common attributes and use. You can combine data from multiple databases using the data segmentation toolkit. It also facilitates data extraction, report generation, export, e-mail broadcast and mail merge. It supports data selection by segmentation codes along with drill down, import and comparison facility. Using the DexPro software you can combine multiple selections into a single extraction. You can export data with great ease. You can include/exclude selections and provide net counts. You can save data in public or private folder. It helps you save and re-use report templates. 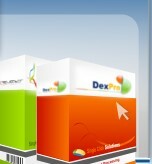 DexPro software is effective for database marketing . >> Find out more features of DexPro software. System Integration Server: System Integration Server software or Central Information Management System at Single Click Solutions is perfect fit for a business that is looking for effective data centralisation solutions. MMM: MMM software is multi-directional software for database mirroring and replication. SMM: This Single Master Mirrioring software helps in database mirroring to any Internet enabled location across the globe. REPLICATOR: Main component of System Integration Server helps in programmatic replication. DE-DUPLICATOR: This de-duplication software allows the user to specify duplicate match, merge and purge criteria to get rid of duplicate data.